Perhaps no player in the country has garnered more attention for his improvement from last season to this than Indiana's Victor Oladipo. After a solid sophomore year in which he emerged as a defensive specialist and energy guy for the Hoosiers, Oladipo has become dramatically more efficient on the offensive end as a junior, leading all top-100 prospects in effective FG%. As we've mentioned before, Oladipo's intrigue as an NBA prospect starts with his abilities as a perimeter defender. An elite athlete with a chiseled frame and solid size and length for an NBA shooting guard, Oladipo combines his outstanding physical tools with a relentless motor, often overwhelming players at the college level as an on-ball defender and causing havoc off the ball. Oladipo makes his presence felt all over the floor defensively, playing with tremendous intensity and always finding ways to get his hands on the ball for deflections and steals, or flying in from out of his area to block a shot or come up with a rebound, thanks to his seemingly endless energy and outstanding speed, quickness, and leaping ability. Oladipo ranks second amongst all players in our Top 100 Rankings in steals per forty minutes, using his athleticism and anticipation skills to play the passing lanes, and also his quick hands to strip his man off the dribble. He has excellent lateral quickness and is able play his man very closely on the perimeter and still stay in front of him, while also being able to recover quickly in the event that he gets beat. With the ability to guard up to four positions at the college level, Oladipo projects to be able to defend all three perimeter positions at the NBA level, depending on matchups. He has the speed and quickness to cover point guards, and his athleticism, strength, and toughness should enable him to guard most small forwards as well. Coaches will likely value the flexibility Oladipo gives them on the defensive end, as they can cross-match and hide weaker defenders while putting Oladipo on the opposing team's top perimeter threat, regardless of position. While Oladipo's calling card as a prospect is his defense, it's the progression in his offensive game that has been the primary reason for his breakout season. After making only 18 of his 74 3-point attempts (24%) in his first two seasons at Indiana, he's connected on an excellent 19 of 37 so far this season (51%) from behind the arc, which ranks second among all top-100 prospects who attempt at least one 3-pointer per game. Oladipo's shooting numbers are likely a bit inflated at this stage with such a small sample size, but it's clear that he's put in the work to improve his jump shot. He looks more fluid and comfortable with his release than last year, and the ball seems to come off of his hands softer, with better rotation and arc on his shot. He's also done a very good job knowing his limitations as a shooter, as 74% of his jumpers this season have come off the catch with his feet set, and the pull-up jumpers he has taken have been good, open looks for the most part. NBA teams will likely want to see more evidence that his early season shooting is not a fluke, as well as see how he might adjust to the longer NBA 3-point, but his improvements are very encouraging and should suggest that the potential is there for him to become an adequate spot shooter in time, assuming he continues to put in the work. Oladipo still does much of his damage offensively when he can get out in the open floor, as over 28% of his used possessions this season have come in transition. He's an absolute blur leading the break with the ball in his hands or filling the lanes, where he's capable of finishing with highlight-reel dunks. In the half-court, Oladipo is primarily an opportunistic scorer at this stage, utilizing his athleticism and energy to make plays off of cuts and offensive rebounds (his 3.4 offensive rebounds per forty ranks first amongst all shooting guard prospects in our database). Over two thirds of his shot attempts come in the basket area, and he's converting on an outstanding 71% of those attempts, as he attacks the rim very aggressively and uses his good body control and excellent elevation to finish. As we've touched on before, Oladipo is fairly limited as a ball-handler and playmaker, with most of his opportunities coming off of straight-line drives on close-outs or when he can catch the ball on the move. Indiana Coach Tom Crean seems to be getting more comfortable using him as a creator, however, as almost 20% of his possessions have come in isolations or as the ball-handler in pick-and-roll sets. He is far more comfortable dribbling and finishing with his right hand at this stage and doesn't show much in the way of advanced ball-handling skills, but he's still able to get the basket at times, as he is very difficult to stop once he's built up a full head of steam and is able to utilize his blazing speed. Oladipo plays unselfishly and is showing a better feel for driving-and-kicking to open shooters, but since he's always playing at full speed, he has a tendency to be out of control and loose with the ball, as evidenced by the fact that he turns the ball over on almost a quarter of his used possessions. Playing on a very talented Hoosier squad, currently ranked as the top team in the country, should give Oladipo plenty of time to showcase himself in front of NBA scouts over the next couple months. With all the buzz he's receiving this season, and the fact that he's on track to graduate in three years, he likely will be tempted to declare for the NBA draft this summer, something he's reportedly strongly considering according to what we've been told. 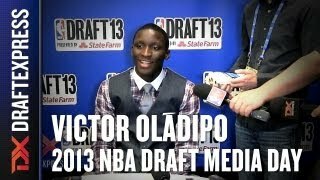 While Oladipo's offensive game is still a work-in-progress at this point and may limit his upside in the eyes of some NBA teams, but he brings tremendous value defensively and looks to have all of the makings of a solid role player, even with a lack of polish in his offensive skill set. His emergence as an efficient offensive player this season is very encouraging, though, and he's shown tremendous growth at his time at Indiana so far, after barely being a top-150 recruit out of high school. He is by all accounts a very hard worker and a gym rat, and he'll be able to hang his hat on the fact that he has a combination of athleticism and energy that can be matched by very few, something that will surely be appealing to NBA decision-makers. With the arrival of Cody Zeller and the turnaround of the Indiana program, Victor Oladipo was in the public's eye far more than he was during his freshman season. Indiana, which had gone a combined 28-66 over the previous 3 seasons, went 27-9 last year, culminating in a competitive Sweet Sixteen loss to eventual tournament champion Kentucky. During his freshman season Oladipo was a role player who got playing time thanks to his sheer effort, with over 50% of his offense coming from transition, cuts to the basket and offensive rebounds. Those still remain among Oladipo's primary strengths, and where his athleticism and finishing ability allow him to remain productive even as the rest of his game rounds out to form, but they were less prominent as Oladipo tried to expand his role on the offensive end. Oladipo is beginning to see a larger portion of his offense from isolations and pick and roll sets. Oladipo has excellent tools as a potential slashing wing, with a very good first step, body control, explosion and touch around the hoop. According to Synergy Sports Technology, he shot 60% on field goal attempts around the hoop, which is around the top 25% in terms of efficiency. Despite his athletic gifts, there are a couple of areas he is currently lacking in that prevent him from being a high volume shot creator. While his ball-handling has improved considerably, it still has a ways to go before he is capable of executing advanced moves and changes of direction with regularity, and he can become turnover prone in traffic. His left hand, in particularly, is still not useful for much more than one or two power dribbles, and his ability to finish with his off hand is still an adventure at times as well. His jump shot is his other major limiting factor, and probably the biggest hurdle to his finding a spot on an NBA roster at this point. His free throw percentage did improve, from 61.2% on 85 attempts to 75% on 144 attempts, which is a good sign. But he overall shot just 21.1% on jump shots and 17.9% on catch and shoot opportunities according to Synergy Sports Technology, both of which place him among the bottom 10% of collegiate players. The amount that his defender is able to sag off of him limits the angles he has to drive to the basket, and makes it hard to envision him being more than an energy guy at the next level until he shows some more consistency. Another area of the game that Oladipo is able to provide contribution is on the glass, with his 2.6 offensive rebounds and 7.9 total rebounds per 40 minutes pace adjusted being in the top five among shooting guard prospects in our database. The offensive glass in particular is a way that Oladipo is able to contribute while the rest of his offense is developing, as his toughness, athleticism, and ability to finish around the hoop are rare traits among wing prospects. Defensively, Oladipo continues to show shut down defensive potential, if only during spurts. He has the physical tools, including length, quickness, and strength to be an incredibly versatile defender, but his fundamentals have not yet caught up to his tools. With a good coach and work ethic, the potential is certainly there as he continues to mature. With Indiana poised to make another strong NCAA tournament run, Victor Oladipo has a chance to play a large role on a team that will get plenty of exposure, both nationally and in the eyes of NBA scouts. If Oladipo can force defenders to defend him on the perimeter, he has the tools to be a high energy role player in the NBA, and his athleticism and finishing ability could open up doors for an even larger role should he show substantial improvement on his perimeter skills. Indiana wing Victor Oladipo showed intriguing flashes of production as a freshman, with upside to spare. After a decorated high school career, Oladipo came off of the bench for the rebuilding Hoosiers and emerged as one of the team's toughest players. As a sophomore, Oladipo has the opportunity to impress scouts by building upon the potential he showed as a freshman. At 6'5 with a solid 210-pound frame, Oladipo has decent size and excellent length for the shooting guard position. He is a very good athlete, as well, and should not have trouble adapting physically at the next level, as he elevates well around the rim and shows excellent speed in the open court. Despite his physical gifts, he averaged just 7.4 points in just 18.0 minutes per game and he struggled with consistency throughout his freshman campaign. His scrappy play and Indiana's lack of depth allowed him to find minutes, however, despite his lack of polish. His offensive game is raw, consisting primarily of hustle plays in transition, scoring off of cuts, and crashing the offensive boards. Unlike many freshmen, Oladipo does a good job of moving without the ball, getting into position to score, and consistently aggressively trying to make plays. He lacks the ball-handling skills, however, to be much of a shot-creator in the half-court. Many of his 3.1 turnovers per 40 minutes pace adjusted came as a result of him dribbling off of his foot, into his man, or simply losing his touch in the paint. Oladipo has the desire to make things happen on the floor, but at the moment, he doesn't always have the skill-level. Learning to change directions with the ball, play at different speeds and improving his basketball IQ will be important for him moving forward. He also lacks much in the way of a perimeter or a mid-range game, which makes his slashing game even more predictable. His jump shot is a work in progress, as his mechanics are inconsistent, he sticks his left elbow out as he releases his shot, and his range even from the college three-point line is questionable. He attempted just 26 perimeter jump shots as a freshman and converted only 30.2%, showing how much he can and must improve in the future. He did manage to finish at an excellent rate inside of the arc at 59.3%, especially compared to NCAA prospects at the shooting guard and small forward positions. He is particularly effective in transition, showing both his quickness and explosiveness in an array of dunks and acrobatic finishes. He scores off of his teammates misses, as well, exploiting his physical advantages and hustle on the offensive boards. In fact, he ranks as one of the top rebounders amongst NCAA guard prospects pulling down 8.5 rebounds and 3.6 offensive rebounds per 40 minutes pace adjusted. Oladipo also shows promise on the defensive end, where his lateral quickness and length allow him to be a formidable man defender capable of guarding both point guards and power forwards. That being said, he must considerably improve his awareness and fundamentals before he can legitimately project as a lockdown threat at the next level. Ultimately, Oladipo has a ways to go before being capable of achieving his long-term potential, and must develop his perimeter game significantly to establish himself a legitimate NBA prospect. All indications suggest that he has the work ethic and character to succeed, though. He must continue to excel on defense, make hustle plays, and crash the boards, nonetheless, and should see his stock rise accordingly if he plays a significant role in Indiana's impending rebirth.